Spartan Junk Removal makes lives easier, we support our community, and we make the world a less junky place. Our Spartan Team is strong, positive, and dedicated to our mission. We have fun when we work and we always get the job done through six core values. We take responsibility for our actions and we always get the job done. n. Be sympathetically or knowledgeably aware of the character and nature of what we do. We use our knoweldge and expertise to teach and help others grow, so we can grow with them. We treat each and every person with respect, acceptance, and honesty. n. The process of establishing something exactly, typically by calculation or research. We establish policy, rules, and procedures to get our work done safely, no matter the challenge. n. A scientific procedure undertaken to make a discovery, test a hypothesis or demonstrate a known fact. We will accept calculated risks, take chances, and make progress to become better, faster, and stronger than our competition. n. The quality of being free from pretense, deceit, or hypocrisy. We seek the truth through transparency, work hard through accountability, and follow through with our promises. If you have any unwanted items or junk you want to have removed, we are here to help to remove your items; we do all the moving, loading, sorting, donating, recycling, and proper disposal of all of your items. When our customers choose us they feel great and relieved because we are reliable, honest, and we take good care them. We handle any type of junk removal from a single item to an entire house clean out or business liquidation. The only items we cannot take is chemicals and hazardous materials, but even then we have you covered. We work closely with a local Hazmat company, who will give you the same outstanding care that you enjoy from years. Do not let a discount junker rob you when you are away; when you need a company that you can trust, we are here to take good care of you. 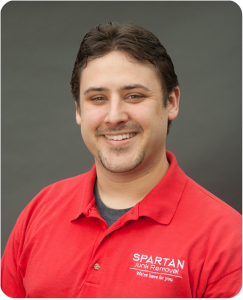 Hi, I am Chris Weir, the founder and Chief Junk Hauler of Spartan Junk Removal. I started junk removal in 2005 when I went with my Grandmother, who was a real estate agent at the time, to a house to get an estimate for a house clean out (it was an estate cleanout) from a big corporate junk removal company. I was hired at that company and I was able to become General Manager for the territory within 2 years of working! I loved that company and I loved the work that I did. During the recession, I went back to school and after some time I started this company. Since then I have serviced 1000’s of customers in our area. My goals are simple: work hard, be honest and upfront, and do the same great job every time. It feels great knowing that we are helping people out and giving them back time to deal with what’s important in their lives. In the end, I just want to be there for you and take care of our community and environment. Schedule My Pickup! We promise will take good care of you for all your junk and rubbish removal needs!